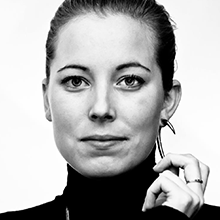 Pauline van Dongen is a Dutch fashion designer specialised in wearable technology. As a creator interested in the notion of interactivity in fashion, she researches the human body in relation to its surroundings. She is fascinated by concepts of change, movement, energy and perception, since she believes the future of fashion lies in its premise to be dynamic and changing. Since the establishment in 2010, her eponymous design studio has received international recognition and is constantly involved in a diverse array of projects that span various disciplines, locations and collaborators. The studio operates a meticulous research on the behaviour of experimental and high-tech materials, combining new technologies with traditional techniques to continuously renovate craftsmanship. With a cross-collaborative backbone, studio Pauline van Dongen aims to merge fashion and technology whilst breathing life into scientific creations.